Our Turkey Bacon is made from premium turkey and hardwood smoked flavor. And, Hill’s Home Market’s Turkey Bacon has 65% less fat than pork bacon, which means you get the mouthwatering bacon taste without all the fat. 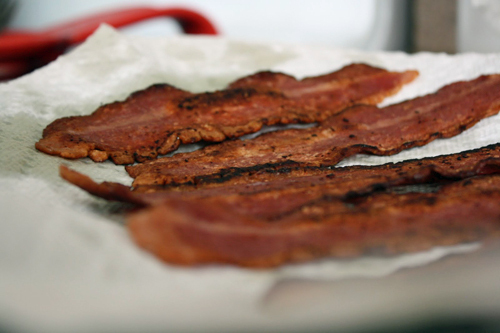 Stove Top: Place bacon slices in a single layer in a skillet. Fry over low heat for 6-8 minutes, depending on desired crispness. Turn bacon occasionally and drain off any accumulated fat. Drain bacon on a paper towel before serving. Microwave: Place bacon slices in a single layer on a paper towel covered microwave-safe plate. Cover slices with a paper towel. Cook on high: 2 slices for 2-2.5 minutes, 4 slices for 3-3.5 minutes.